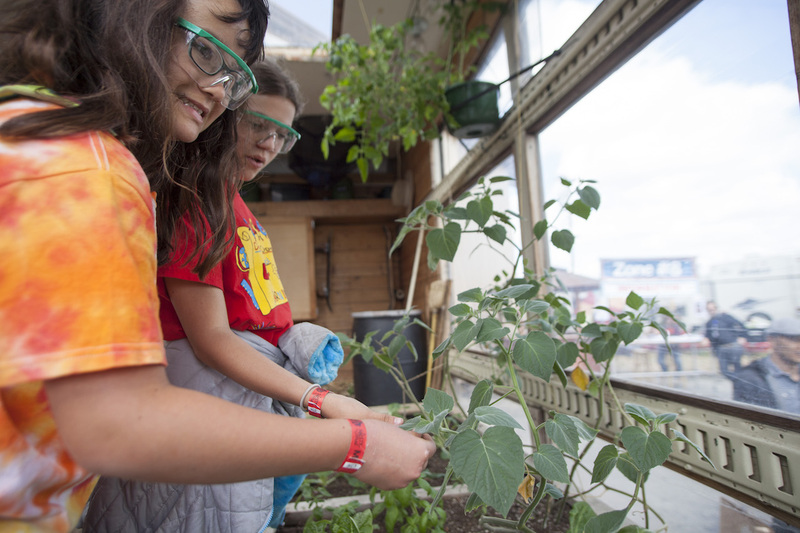 It was the first day of the 2016 San Francisco Maker Faire and the expressive faces of children beamed with anticipation as they clambered off school buses, keen to see the spectacle that spawned a worldwide maker movement. How high might the bar be set for events and exhibits there? More than 150,000 people passed through the gates on a cool and breezy weekend in May. The first of three days was devoted to more than 4000 students—kindergarten age through college—who came for a daylong field trip. The takeaway was not the plethora or quality of hands-on science and technology-saturated exhibits, but the exuberance of students mesmerized by the eerie glow of moving robotic arms, dancing lights mysteriously dangling overhead, a tower-high city of masking tape and jungle of edible greens growing out of a truck. 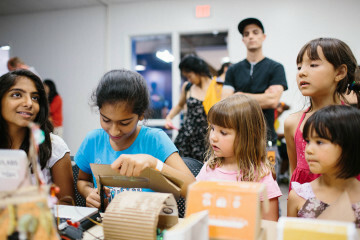 The ignited imagination knows no bounds, which is what the maker movement is all about. Drone Racing. Courtesy of Bay Area Maker Faire. 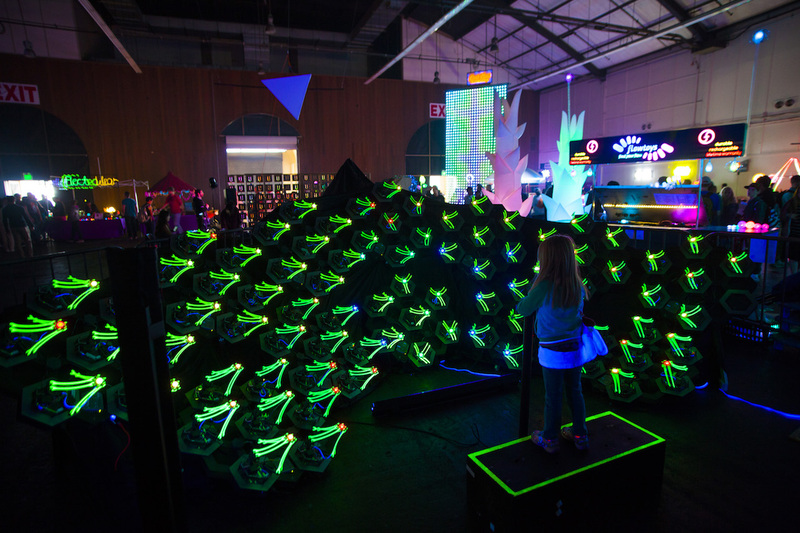 The sound of a swarm of angry bees drew us first to the action beneath a 16,000-square-foot tent where a neon-bright obstacle course radiated a colorful glow. Drone Racing was underway, orchestrated by the engineers of the San Francisco-based Aerial Sports League, a 1,000-member group that claims to have originated the now popular sport in 2013. 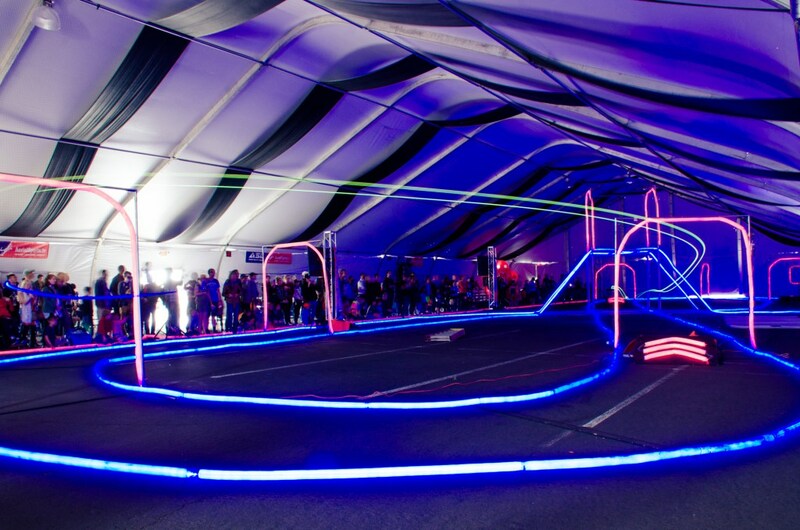 This year the faire course moved indoors where the lights of the racing drones could be followed more easily by spectators, explained Erika Bergman of ASL. Pilots wearing headsets watched as their drones raced the course against each other and the clock on two-minute runs, ticking off points as they deftly maneuvered the loops and turns. Inquisitive spectators were invited to meet the operators and learn more about drone operation. Tapigami’s installation for the Bay Area Maker Faire. Courtesy of Bay Area Maker Faire. A towering city sculpture spread out across the floor looked, at first, like a display of paper flower gardens and skyscrapers. The detail was indefinable until, upon closer inspection, you realize this metropolis was made by hand using three things: household masking tape, scissors and glue. The barrier to creation lowers when children learn that art is accessible, he adds. 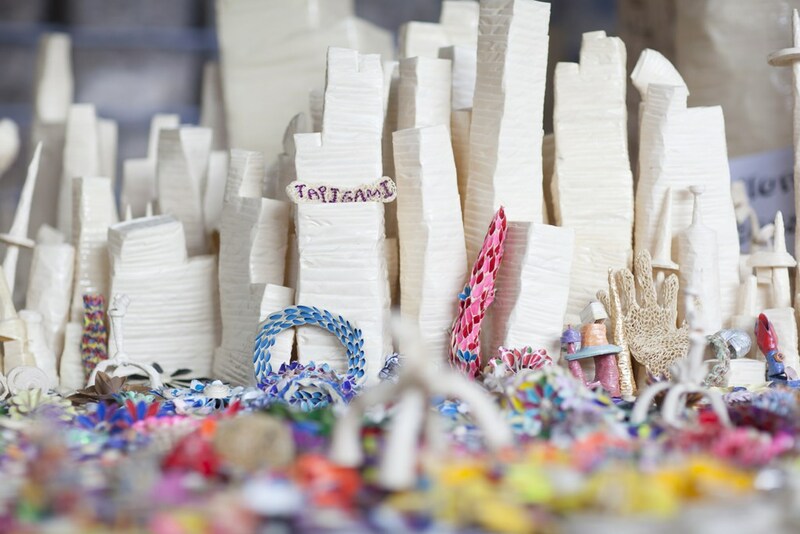 The idea behind Tapigami is to strengthen social bonds within communities and teach budding artists that they can change lives with simple tools around them. An educator as well as an artist, Scheible visits classrooms across the country as he spreads his message. 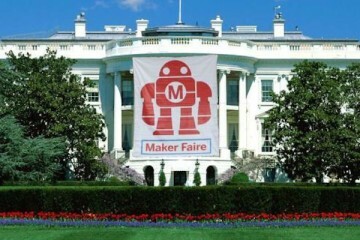 The display has appeared every year at Maker Faire since 2012 and has won numerous awards. Nova by LED Lab. Photo by Mike Benna. Oakland-based artist/engineer/programmer Christopher Schardt loved building things as a child. In 2000 he poured that childlike spirit into works of art—large-scale propane and LED light displays—that he erects each year at Burning Man, the annual gathering at the Black Rock Desert in Nevada. 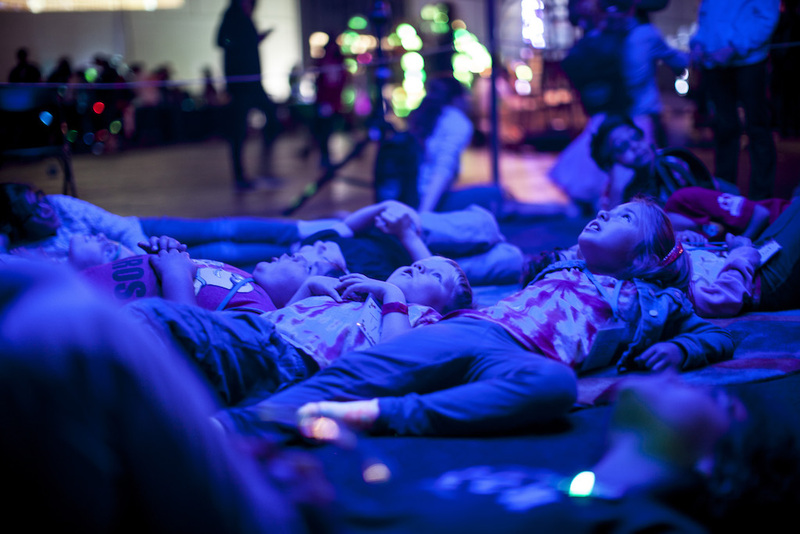 Children flocked to his towering teepee that enticed people of all ages to lay prone and watch the dangling play of lights overhead as they pulsated to the music. 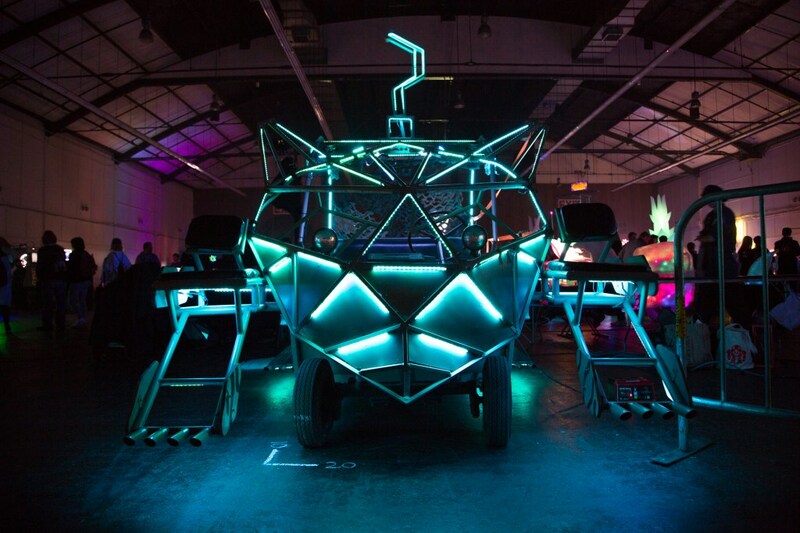 Nova is a smaller-scale version he designed for Burning Man. Indeed, several looked like they were meditating. Compass Green Project. Photo by Mike Benna. This fully functional greenhouse on the back end of an 18-foot box truck brimmed with thick, healthy stalks—vegetables, grains and herbs. People of all ages climbed on board to touch and inhale the oxygen-infused air. Wherever the Compass Green truck goes—powered by waste vegetable oil, of course—it spreads its gospel of cultivating and growing food through water conservation and bio-intensive methods of farming that yield maximum crops with minimal resources. Light Play by ROBOT Army. Photo by Mike Benna. The line for this exhibit was long, demanding closer inspection. At the center, a small child stood like an orchestra conductor before 84 individual robots, each with a red eye that collectively took cues from the wave of the child’s hand. The delta robots react with patterns of motion and light to simple hand movements, explained Mark Koch, the Silicon Valley engineer who created the exhibit with partner, designer and propaganda master Sarah Petkus. The human-to-machine interaction offered participants an otherworldly experience of control. This article is part of the Remake Learning initiative, a multimedia partnership between NEXTpittsburgh and WQED Multimedia, Pittsburgh Magazine and WESA. Check out their stories on Learning Innovation in Pittsburgh.